Sharp correction in pharma majors - A buying opportunity? Sun Pharmaceuticals has declined by 16% in the past two weeks. It now trades at its 52-week low price. Dr Reddy's declines by more than 21% in in the past two weeks. Its not very often that you get to hear such type of news. After all, they are related to amongst the biggest and best run companies in India. And that too in a sector that has enormous growth potential. And such sharp price corrections are enough to grab the attention of long term investors. As it turns out, the strict norms of the US Food and Drug Administration (FDA) has not even spared the Indian healthcare majors. Today's chart of the day indicates the price movement in the top five stocks (by market capitalization) forming part of the BSE-Healthcare index. Trying to get a better understanding of how bad the situation really is, I sent a mail to my colleague (who tracks the healthcare sector) to get her views on the sharp correction in these stocks; and whether the problems are temporary in nature. "The big pharma companies are believed to be the cream of the Indian Pharma sector. These companies have witnessed sharp growth in the past. While they continue to develop niche molecules and have quite a lucrative portfolio to launch in the coming years, the regulatory challenges have become one of the biggest risks for their growth. The regulatory landscape in the pharma space is increasingly becoming stringent. Most of the pharma companies in India have received negative observations from the USFDA regulators across their manufacturing facilities. What's more, if the regulator believes the compliance issues to be more serious, stricter steps could be taken. We have already seen this happening in the case of Dr Reddy's - the company received a warning letter on its three facilities. In the case of Sun, an OAI (Official action indicated) was issued. Since the regulatory consequences are very difficult to predict in such cases, the biggest risk is, the time taken to clear the issues. Therefore, investors should take a call on case to case basis, rather than just buying the beaten down ones. One should keep in mind some factors like revenues and profits contributed by such facilities, management's past track record to deal with such events, whether there are any other back up facilities.While most of the big pharma companies have quite a comfortable debt position, one should however, avoid those companies which have high leverage as well as those undergoing compliance issues. And most importantly, one should limit exposure to such stocks." Equitymaster requests your view! 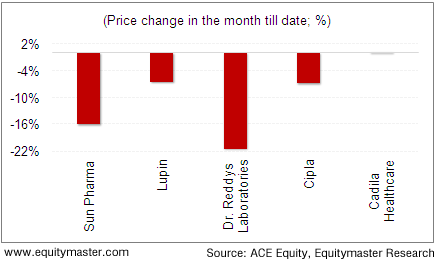 Post a comment on "Sharp correction in pharma majors - A buying opportunity?". Click here! 1 Responses to "Sharp correction in pharma majors - A buying opportunity?" Well, the Chart is factual. There are comments from " your colleague" ( which anyone invested in the pharma sector already knows ). But what are the recommendations of EM - which of these five stocks to buy and which one to avoid ?